Nepal's changing demography provides conditions for broad socio-economic transformation, but is the political class ready to lead the country in that direction? This week the Central Bureau of Statistics (CBS) released the final report of Nepal's Population and Household Census conducted in 2011. The 278-page report points towards dramatic changes in Nepal's demography that will have greater social, political, and economic significance in the days to come. The rise in literacy rate, women's increased share in the economic pie, and robust working age population are encouraging indicators for a growing economy. However, these broad scale changes warrant deeper scrutiny and analysis. The last decade has seen significant improvement in Nepal's literacy rate. Female literacy has jumped from below 35 to 57 per cent. Recent reports from various organisations also point towards improved enrollment rate for girls in primary, secondary as well as higher secondary education. However, the rise in the number of women leading households and those owning property points more towards the absence of male population in the economy than women's empowerment. Besides, the literacy rate of women, especially those from the most deprived sections including Dalits and Muslims remains disappointing. The other important indication from the census report is that 57 per cent of the country's population is of robust working age. This excludes close to two million absent population who have migrated to other countries in search of better opportunities. The protracted political crisis, leading to economic downturn, has frustrated the young population who are leaving the country in large numbers. The productive age-group is also the most assertive and failing to address their needs could sow new seeds of conflict in Nepali society. The growing militancy among the youth, especially those in various youth wings of major parties and in the Tarai's armed groups is a disturbing sign. The recent attacks on the party heads of NC, UML, and UCPN-M are bitter experiences that Nepal's political class would do well to learn from. 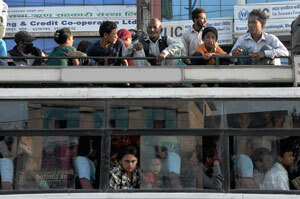 The Census reveals that almost half of Nepal's population now lives in the Tarai. This dramatic demographic shift is due to accelerated in-migration from the nearby hill districts. The harshness of life in the mountains - the absence of basic amenities like roads, electricity, and drinking water as well as the digital divide - is forcing people to move towards the more accessible Tarai districts. "Madhes is already an agricultural and industrial hub, and with growing national and international investments, it will become the backbone of Nepal's economy in the coming decades," says sociologist Chaitanya Mishra. However, in-migration from the hills is also creating a cultural flux which could lead to bitter conflict for social, political, and economic control over Madhes. The political parties will look to consolidate their position in the Madhes, which is sure to become a hot-bed of Nepali politics in the coming days. The Madhesi Morcha will lobby for more constituencies in the Tarai to increase its influence in national politics, while the growing number of people from non-Madhesi origin, who now make up one-third of Madhes' population will also play a crucial role in setting agendas for future elections. Needless to say, New Delhi's plans to influence its stake in Nepali politics through Madhes will be even more pronounced. The signs will emerge in the coming weeks as the parties look for a 'consensus candidate'. Given the comprehensive coverage, the Census report also provides useful information to the planners in terms of reflecting upon the impacts and future needs. The trend of population exodus from the mountains points towards the need to invest in basic infrastructure in the region and address the digital divide. Similarly, growing density in the cities demand expansion of services and security. Nepal's demographic changes provide material conditions for its socio-economic transformation and it is the responsibility of the political class to lead the country in that direction. But by engaging in endless bickering, Nepal's political parties will not just betray public faith, they will be guilty of failing the institution of politics.